A leader in technology and innovation, Southwire Company is one of North America’s largest wire and cable producers. Southwire® and its subsidiaries manufacture building wire and cable, metal-clad (MC) cable, FlatWire Ready® products, cord products (including Tappan™ sound, security and communication cables through Tappan Wire & Cable Inc.), utility cable products, industrial power cable, OEM wire products, copper and aluminum rod, and continuous casting technology. Southwire also supplies MAXIS® wire and cable installation tools to the commercial, industrial, and utility construction markets. CARROLLTON, Ga., Feb. 18, 2013 – HVAC contractors can now get a better handle on jobs involving installation of mini-split air conditioning units with Southwire’s new EZ-InTM cable, which makes installation of ductless AC units quicker and easier, while ensuring jobs meet code. Mini-split AC units are growing in popularity, especially in multi-family units and in homes where new additions are being constructed. Typically contractors have had to run two different wires – one approved for outdoor use and one for indoor use – through a junction box and use conduit or a cable tray to power mini-split AC units. Southwire EZ-InTM cable is an all-purpose cable that meets code for both interior and exterior use, increasing the speed of installation and making sure the job will pass inspection. "Southwire EZ-InTM Mini-Split cable makes installing ductless AC units quicker, easier and more efficient for HVAC contractors," said Donna Graham, Vice President, Marketing, OEM Division at Southwire. "Southwire talks to its customers and brings products to market like the EZ-InTM Mini-Split cable that address jobsite issues HVAC contractors face on a daily basis. HVAC installation crews will no longer have to run two different wires or break the line set on mini-split AC jobs." Attendees at the recent AHR Expo in Dallas got a sneak peak of Southwire EZ-InTM Mini-Split cable, which is available in both solid and stranded versions. More than 30,000 contractors, engineers, facility managers and original equipment manufacturers attended the AHR Expo, where 1,800 exhibitors displayed the latest products and services for the heating, ventilation, air conditioning and refrigeration market. "Sales of mini-split AC units are growing, so HVAC contractors at AHR gave Southwire EZ-InTM cable a pretty enthusiastic reception," said Jeff Watts, Product Manager, OEM Division. "With this new product, crews can use a single cable for an entire job and be confident the wiring for the installation meets code. And with Southwire’s network of regional service centers, HVAC contractors can count on on-time delivery and superior service." Southwire Company, one of North America’s largest producers of wire and cable, is releasing a series of mobile apps that will offer electrical contractors, utilities, OEM’s and other end users of Southwire’s products and services powerful mobile tools that they can access on-the-go to maximize productivity. "On visits to jobsites and customer locations, we observed how much time managers spent away from their desks and their computers. The Southwire Mobile Apps are designed to put powerful tools in the hands of end users and customers. These mobile apps can help to calculate everything from the amount of cable left on a reel, to appropriate conduit size, to the voltage drop and current carrying capacity of an electrical circuit," said Stu Thorn, President and CEO of Southwire Company. "Smartphones and tablets are more common today for business applications, even on jobsites. We’re investing in developing a series of apps that will help both customers and end users of our products get their jobs done more efficiently." The first seven apps are now being released by Southwire, with several more to follow later in 2012. The apps focus on core needs that customers and product end users have to manage every day, like selecting and installing products and converting units of measure for more accurate pricing of quotes. The apps also make it simple to email the results to others on the jobsite, such as suppliers, when more materials are necessary, and inspectors, in connection with regulatory compliance. MCAP® Cable Savings Benefit Calculator, which quickly illustrates the labor cost savings of using MCAP® cable when compared to traditional MC for electrical contractors. Conduit Fill Calculator, which uses NEC® Code to determine which conduit size is right for electrical installations. This app also includes the capability to calculate conduit-fill for Utility Applications. App users can email calculator results to others. SIMpull® Cable Pull Calculator, which measures specific pull characteristics of different wiring and generates NEC-compliant solutions, which can be emailed by the app user. Southwire Electrical Product Catalog. This app offers mobile-optimized product data sheets, and enables contractors to look up and email product information and stock numbers. Conversion Calculator. The app offers data for converting CU to AL, unit price to another unit of price, and one measurement unit to another measurement unit. The Conversion Calculator should be particularly helpful to OEM customers. Proof Positive® Copper app. This app helps to track stolen wire. After Proof Positive® Copper has been stolen; the app user can simply enter the license key and serial number from the recovered wire. The current owner and chain of ownership will be displayed on the ownership data screen. These seven apps come on the heels of Southwire’s successful Voltage Drop Calculator app, which Southwire released in 2011 and which currently has over 10,000 downloads on iTunes. A national industry study conducted earlier this year by Eric Mower + Associates Group B2B found that 50 percent of contractors use a smartphone, 49 percent use a laptop with mobile web access, and 21 percent use an iPad® tablet or other similar tablet device for their jobs. These statistics suggest that more business research and materials purchasing functions are being conducted online from the field rather than behind a desk. Out of those contractors that use a smartphone, more than half (53 percent) use a smartphone in the purchasing process to do things like research brands and products, compare prices and scan product codes. A 2010 Forrester study suggests tablet devices will outsell desktops by 2015. If recent numbers from sales of the Apple® iPad tablet are any indication, this shift may happen even sooner than projected. "Southwire is known as an innovator of products and services that improve jobsite efficiency. We are continuing that leadership by being the first wire and cable company to invest significantly in the development of mobile apps specifically designed to help make the lives of our customers easier," said Thorn. "The Southwire Mobile Apps help our customers to ‘Work SIMpull™’ and work efficiently even if they are on a jobsite miles from the office." The introduction of the Southwire SIMpull WireBARREL™ circuit management system offers electrical contractors an innovative advancement in the way branch circuit wiring is installed. The system includes NoLube® SIMpull® THHN made available for the first time in circuit-sized conductors paralleled in the barrel package, a new MAXIS BarrelTRUCK™ hand-truck, and a MAXIS BarrelTAP™ wire-guide. This combination of products and tools improves home run circuit installations from the moment wire arrives at the jobsite to final installation. Like other Southwire SIMpull Solutions products and services, the WireBARREL system provides a solution that can improve productivity, while offering yet another way for contractors to manage installation costs. The system essentially replaces the wire cart and multiple reels, thus removing the difficulties associated with maneuvering the cart and repeatedly handling heavy reels. 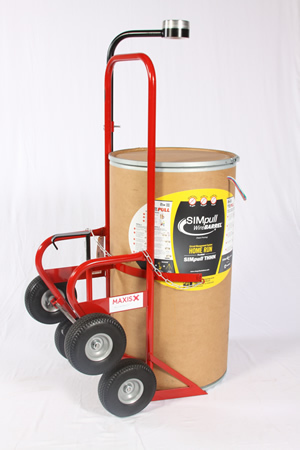 The MAXIS BarrelTRUCKTM hand-truck and MAXIS BarrelTAP™ pay-off device are both equipped with a universal wire-guide feature. This feature allows for a smooth and consistent means of guiding the paralleled conductors out of the WireBARREL package, thus requiring very little effort by the installer. You simply roll the WireBARREL system into place - even through narrow electrical room doors - and you are ready to start your pull. "Unlike the traditional use of individual reels and wire carts for branch circuit home run installations, the patent pending SIMpull WireBARREL™ concept is a unique system approach to solving branch circuit wiring challenges. We’ve paralleled individual branch circuit conductors together into standard home run packages. We call this our circuit Barrellel™ process. The result -- more wire with a smaller footprint, in an easy-to-transport, easy-to-use barrel. They’re in-stock and ready to ship today," says Phil Tuggle, SVP of Marketing and Business Development for Southwire’s Electrical Division. "The SIMpull WireBARREL is a jobsite game changer," stated Tuggle. "Our SIM Technology® innovation has proven to reduce installation steps and make the pulling of feeder-sized conductors easier and more efficient for over 8 years. We’ve now extended this benefit to circuit- sized wires and combined it with a unique packaging and transport option resulting in fewer steps and less complexity for branch circuit installations. More importantly, there’s an additional benefit of reduced worker fatigue…no heavy reels to lift and significantly less effort required to pull the wire through the conduit compared to pulling from reels on a wire cart," added Tuggle. Southwire’s SIMpull Solutions® umbrella includes its patented SIMpull® ROMEX® brand NM, SIMpull THHN®, and SIMpull XHHW-2® cables; SIMpull Head® pulling grips; SIMpull StackTM reels; and SIMpull Truck™ delivery. Since its introduction in 2009, Southwire’s SIMpull Solutions offering of products and services has racked up a variety of industry awards that recognize the products as being a smarter, faster, and safer way to handle the wire and cable installation process.